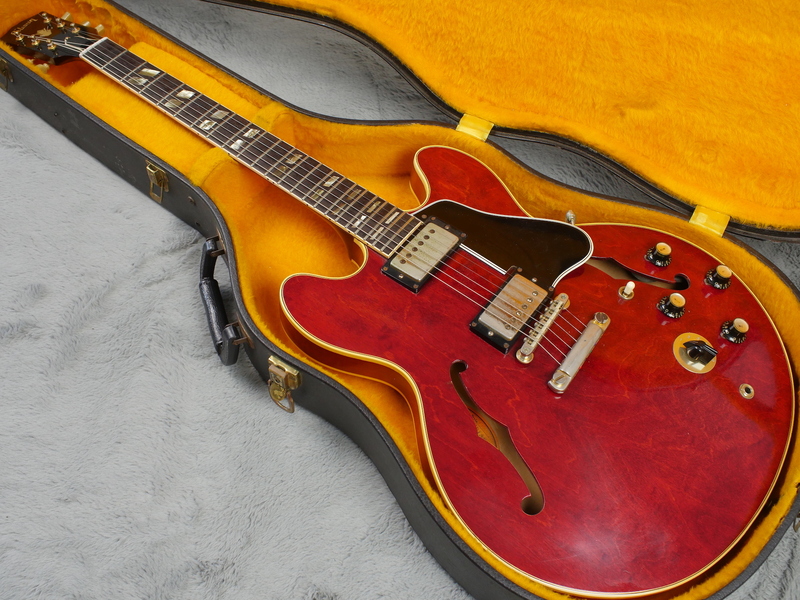 Bar a refret with slightly larger frets, this very nicely figured Gibson ES-345 is all straight and correct, it also has it’s correct hard case and is in very nice condition indeed. 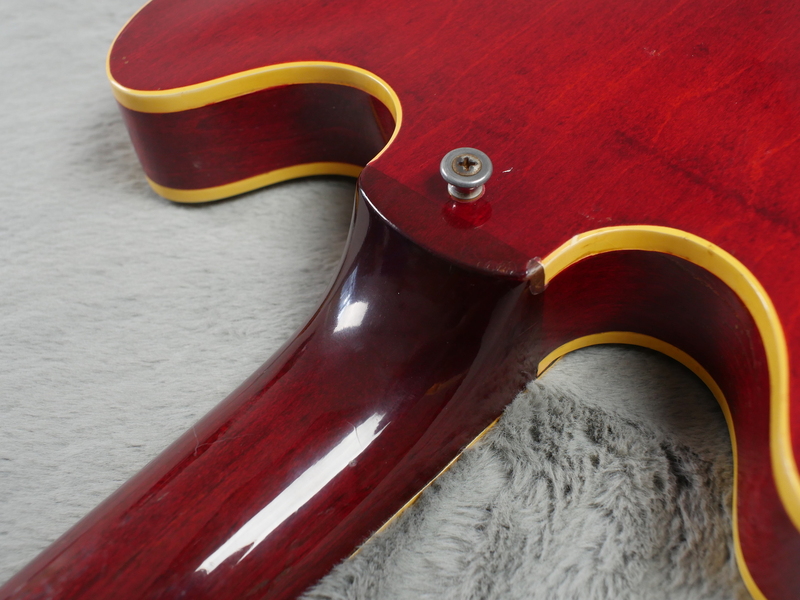 This is the year that has the classic neck profile that is medium chunky, almost just like a 59 neck profile and as a result of this, it is a very nice guitar to play, hold and feel. 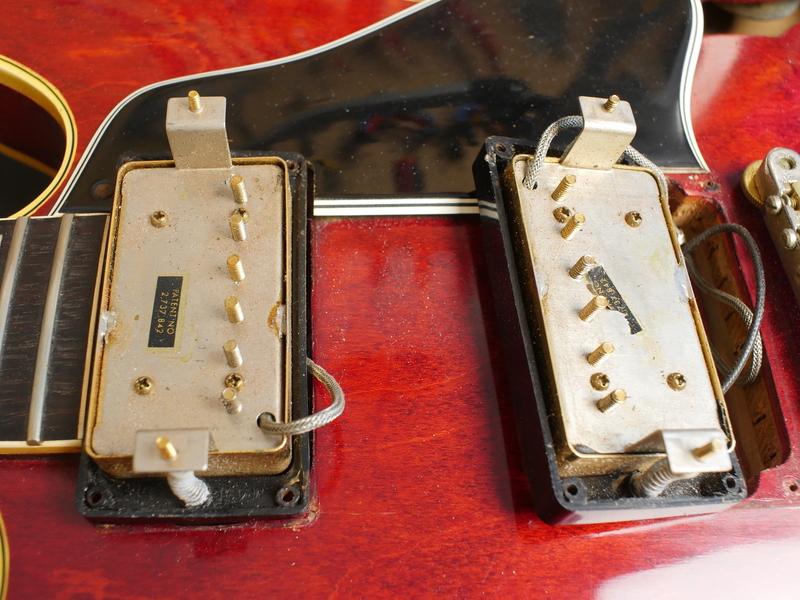 Electrics all untouched with two original PAT Number sticker pickups that have never had the lids prised off. 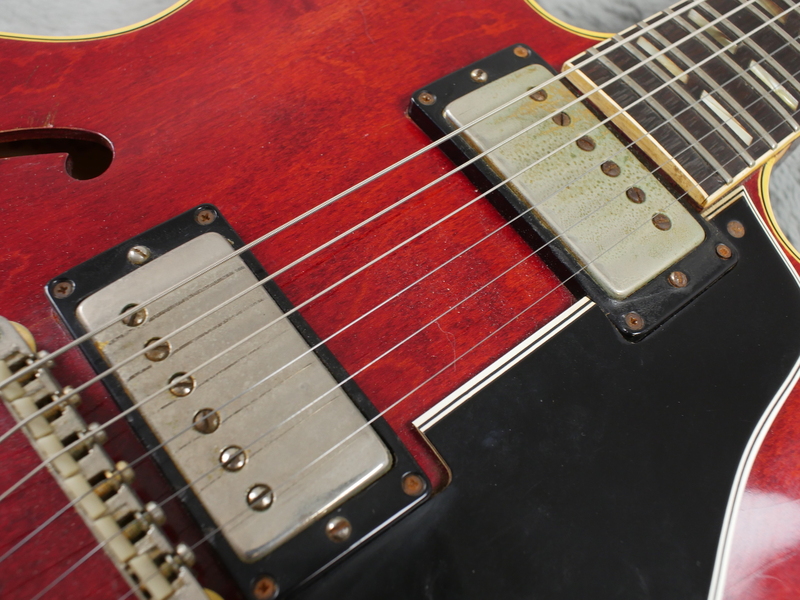 Just the way we like it. 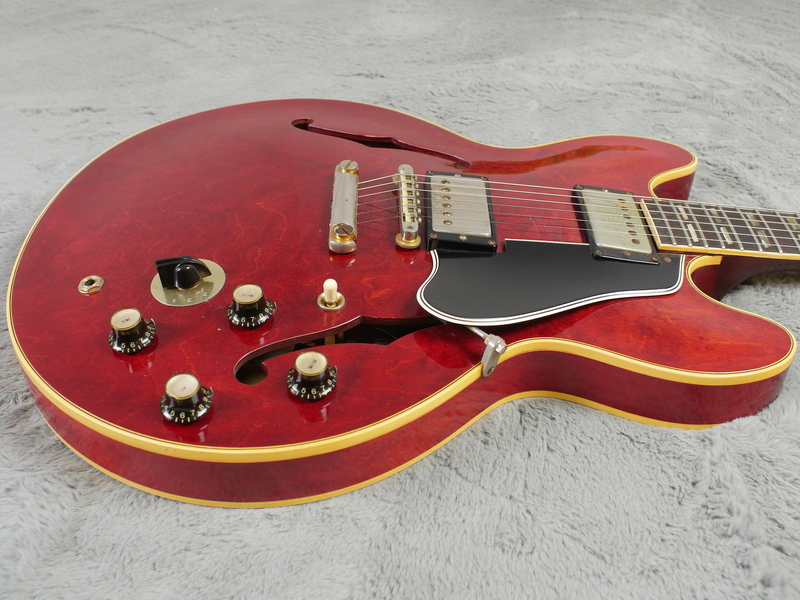 Nice playing action and brilliant, classic sound make this a very cool guitar that is priced at least 5k cheaper than what a 64 335 would sell for. 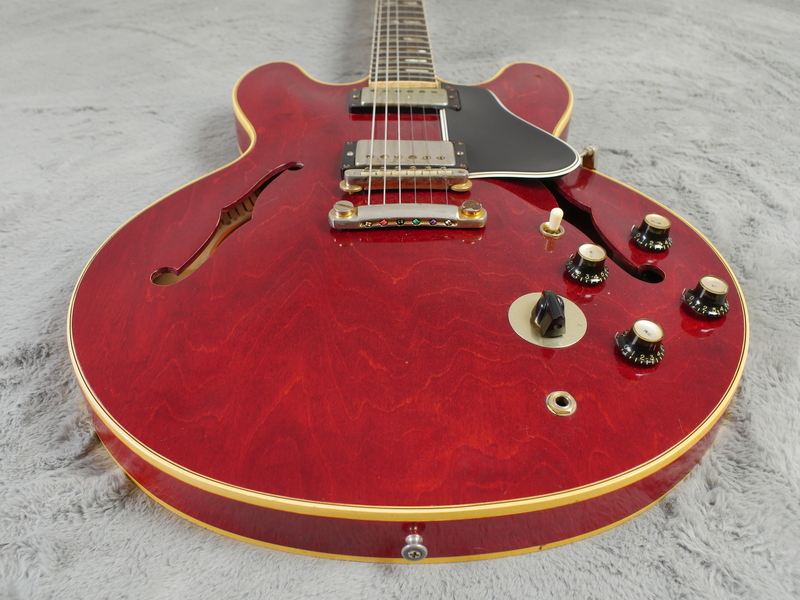 Looks better than a 335 too in our opinion. 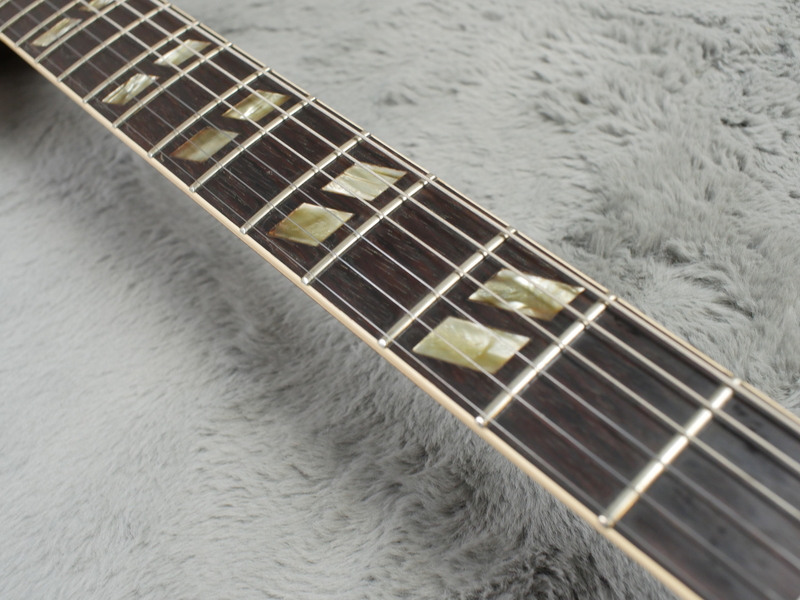 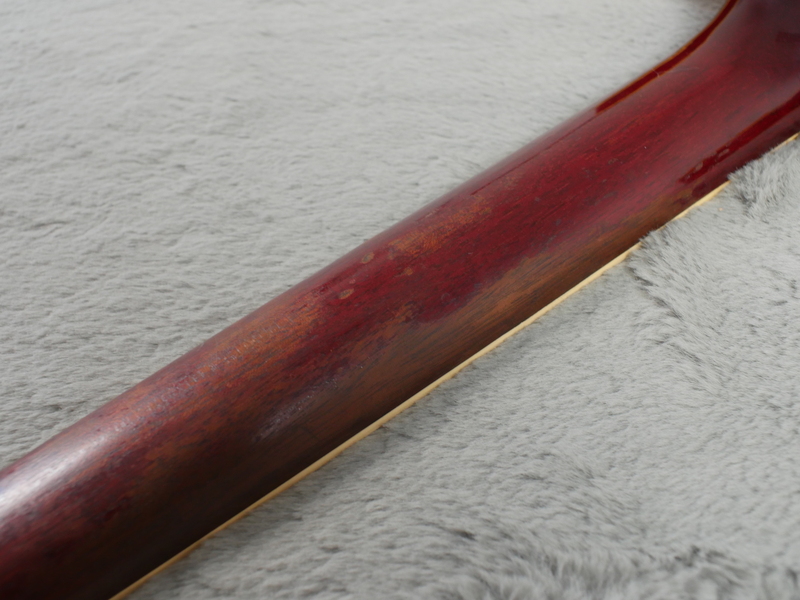 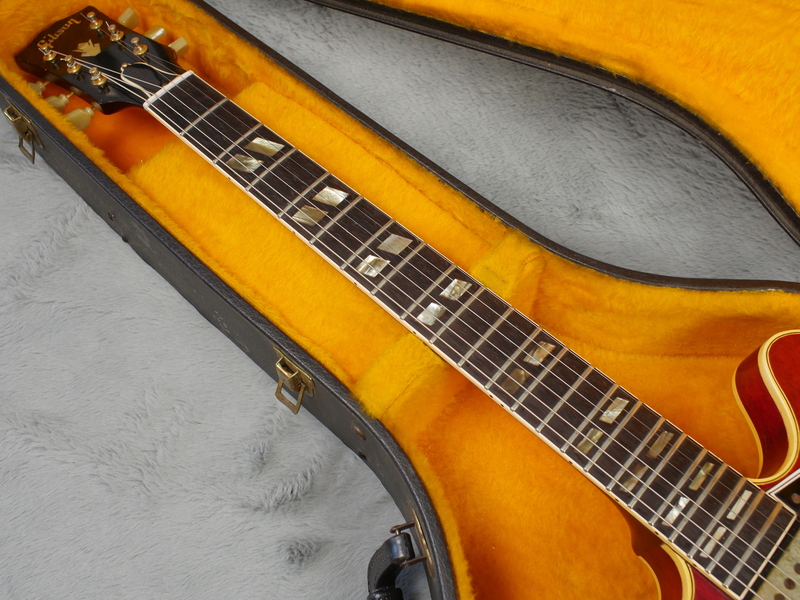 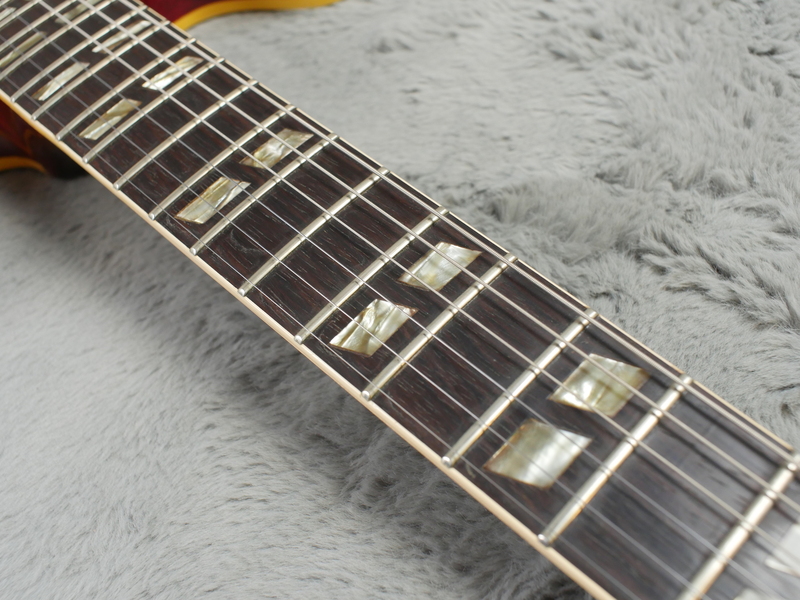 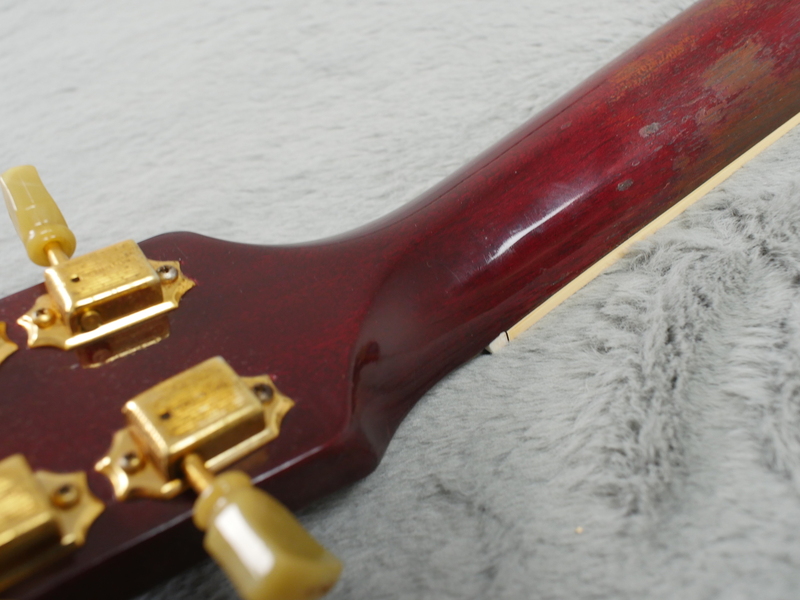 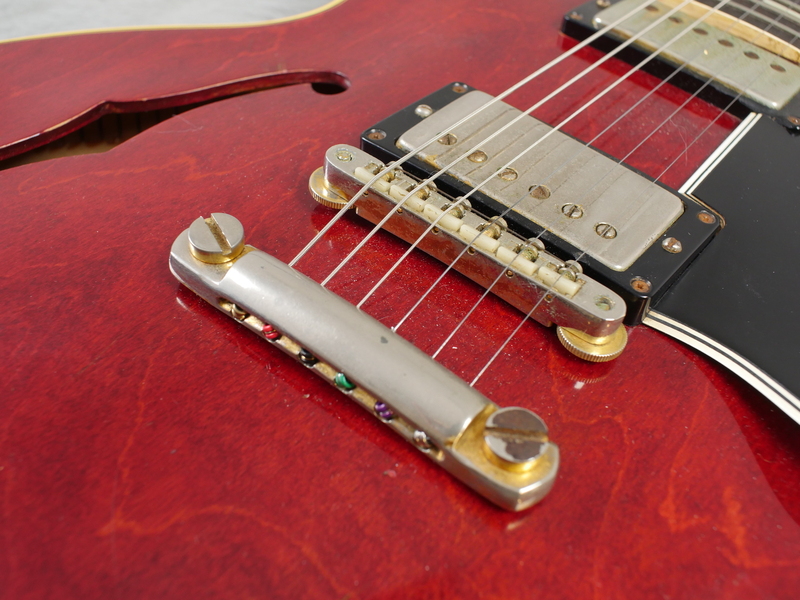 It is in very nice condition, it has been played so does have a few dings here and there but overall, it is a very nice example and one of the more desirable ES-345’s being firstly a stop tail version and secondly a decent full feeling neck. 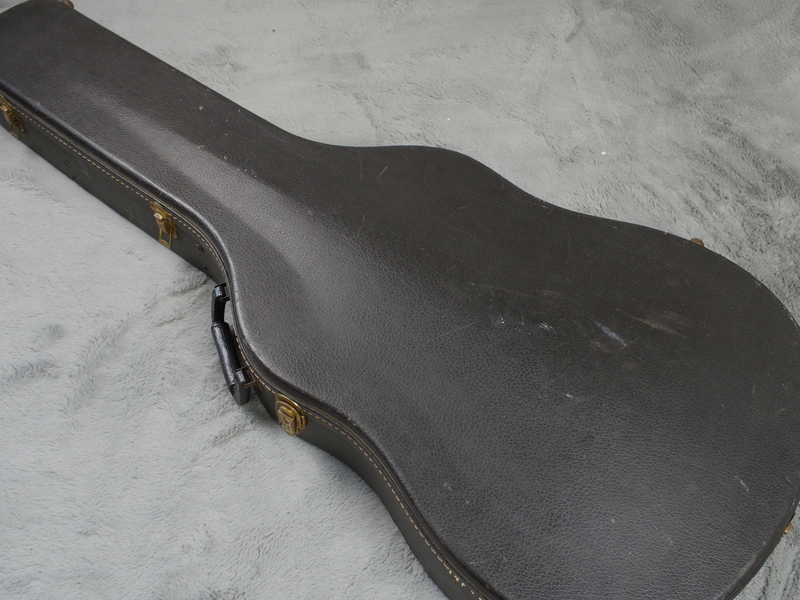 No structural issues, no cracks, repairs or over spray anywhere and no finish touch ups either. 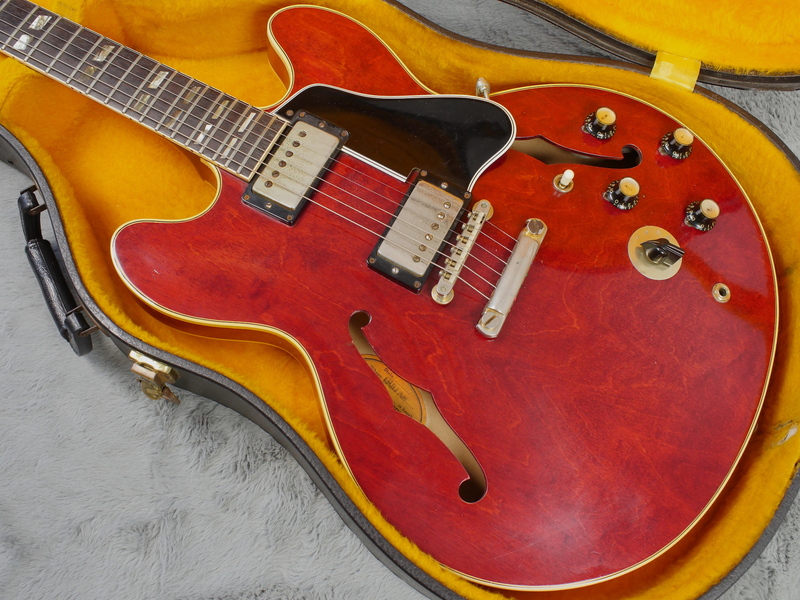 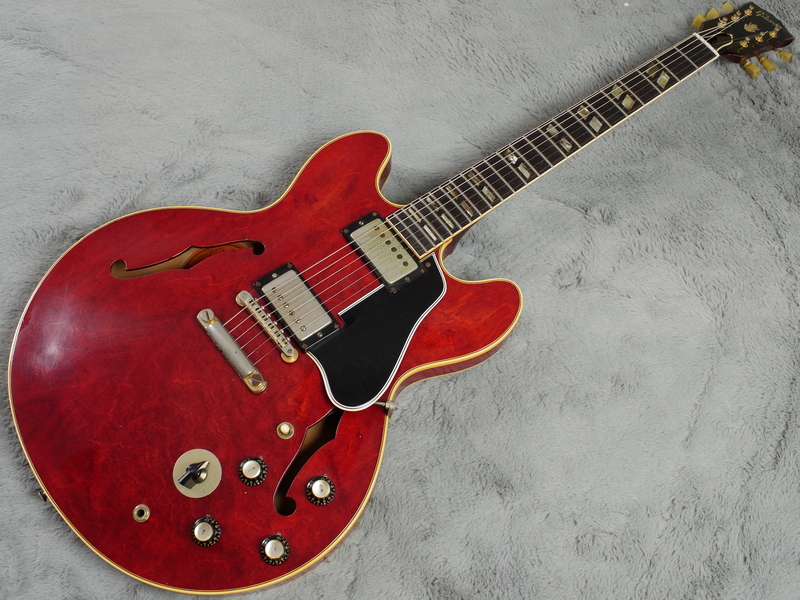 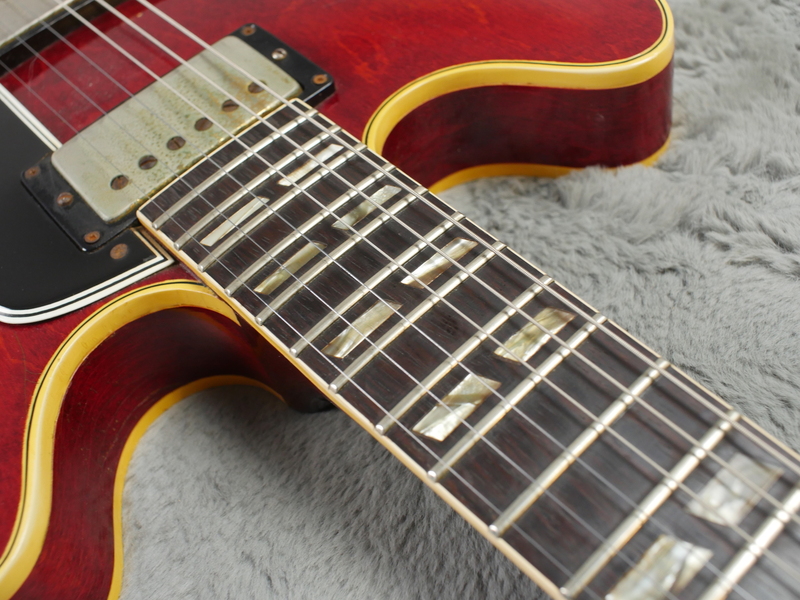 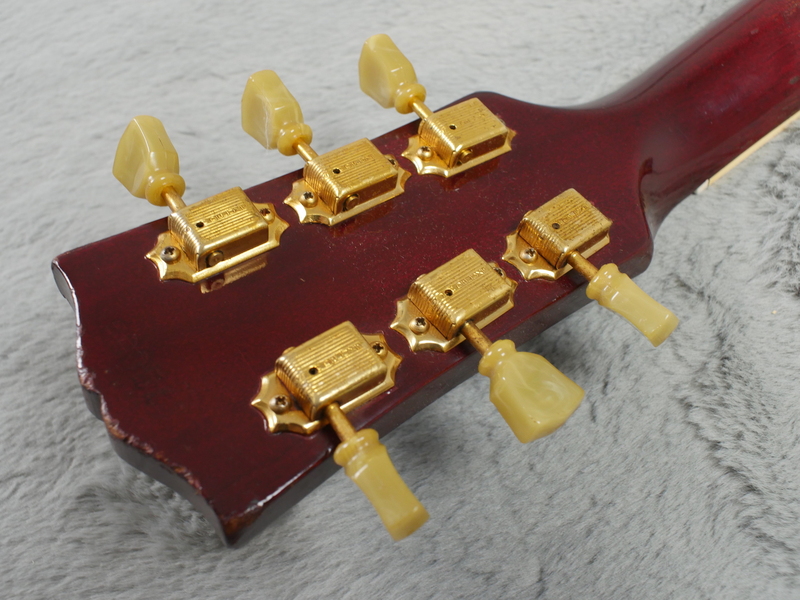 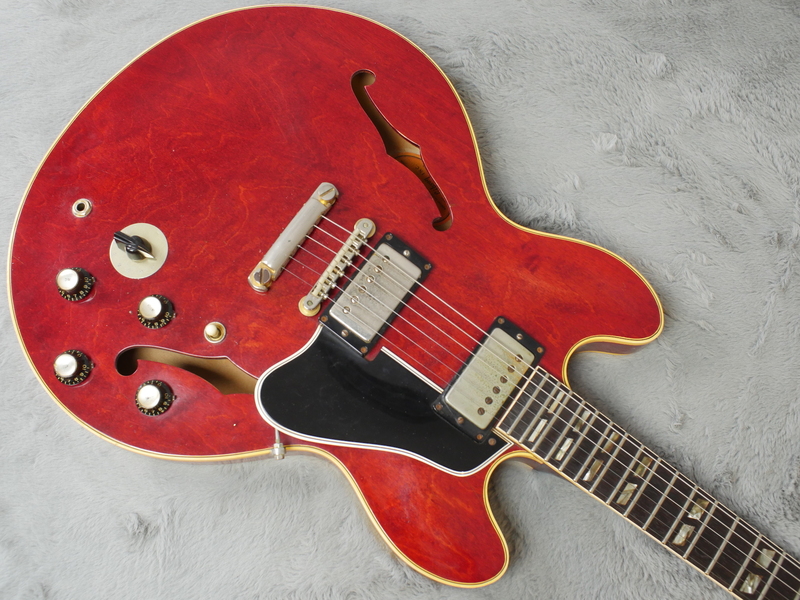 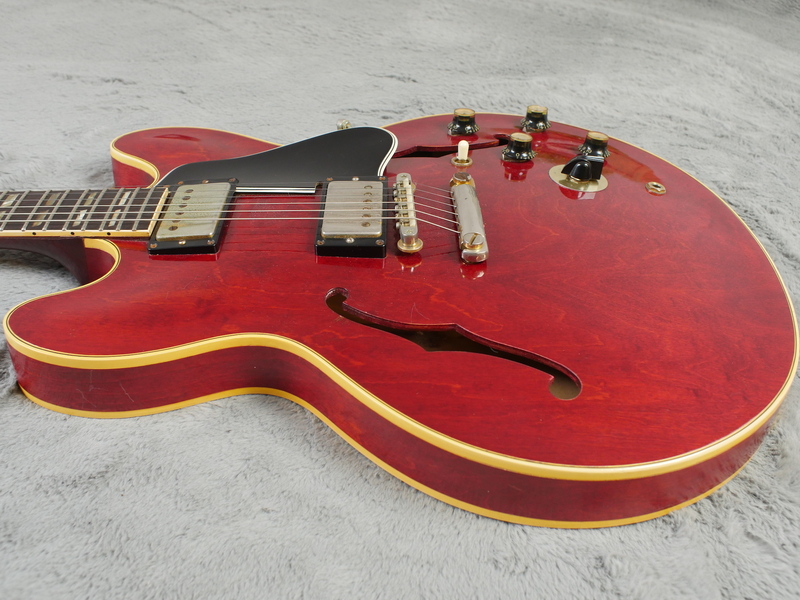 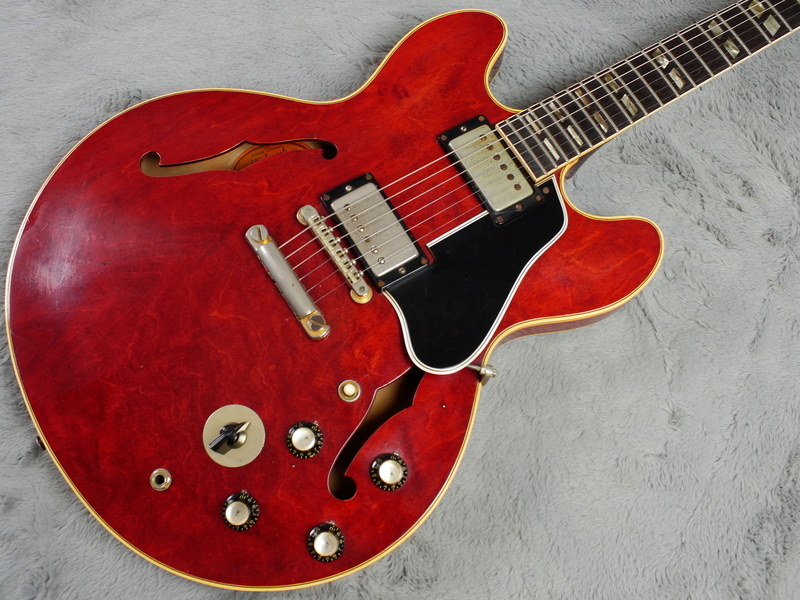 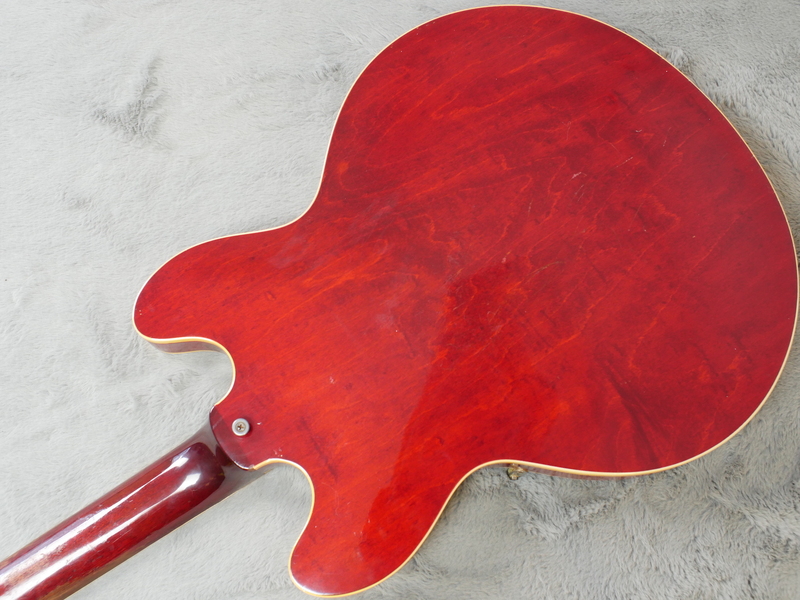 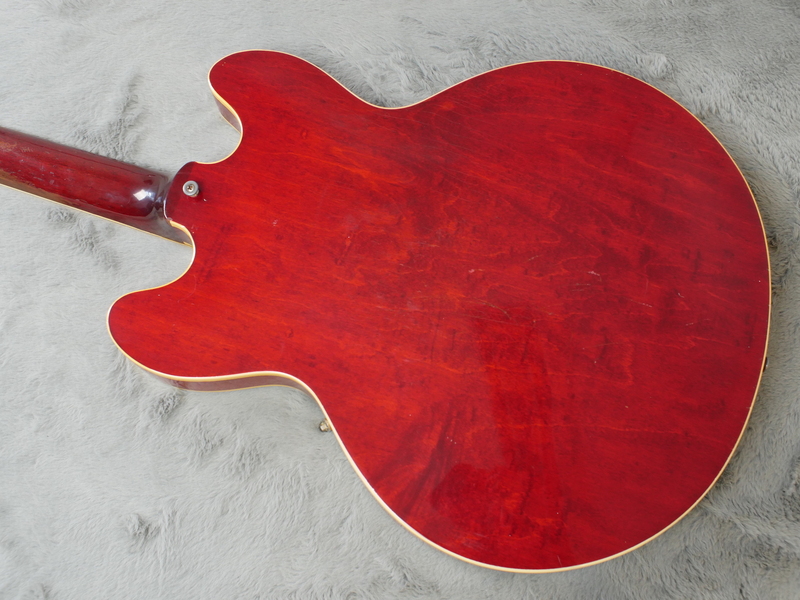 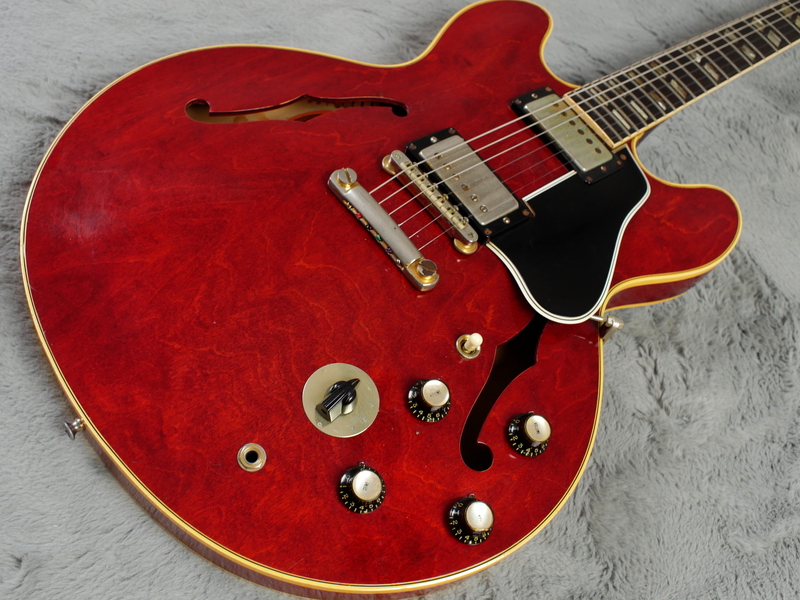 Have a look at the top, on this one it has a most pleasant figure and gives some evidence to the rumour that Gibson saved their best pieces of top ply for the 345 and 355 models over the 335. 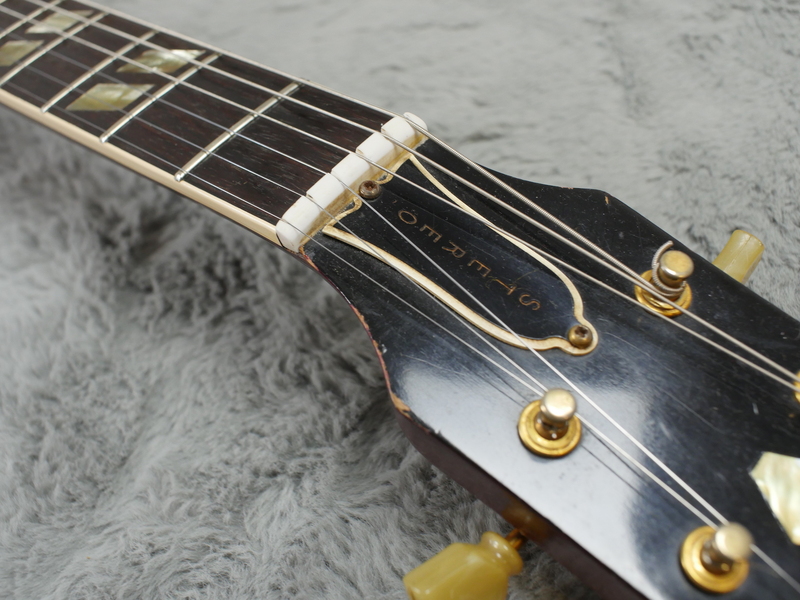 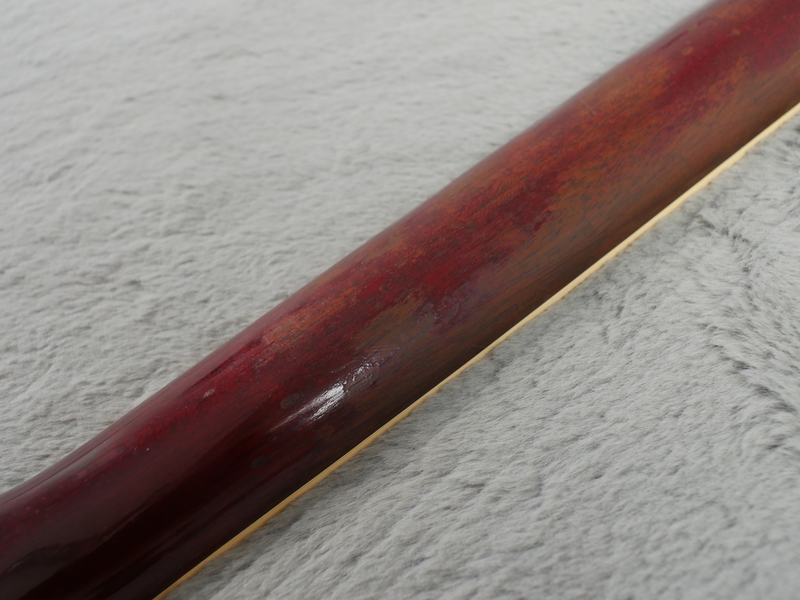 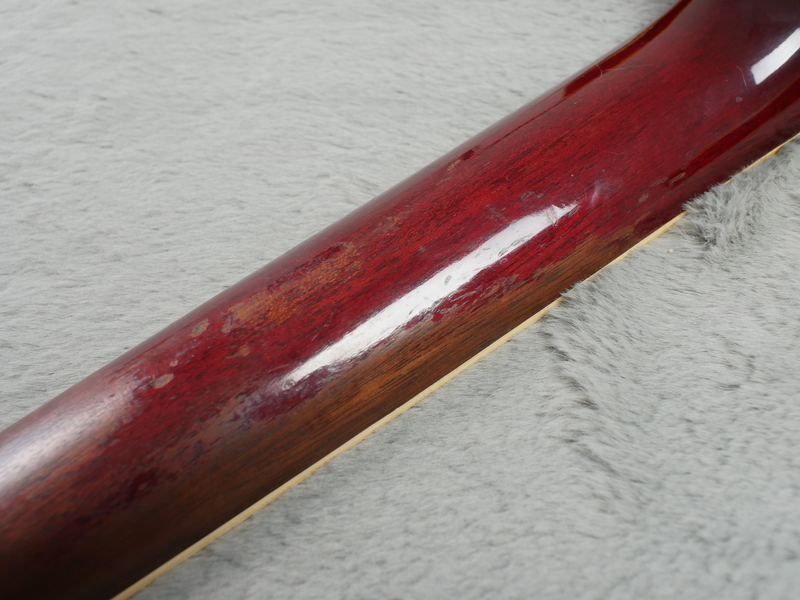 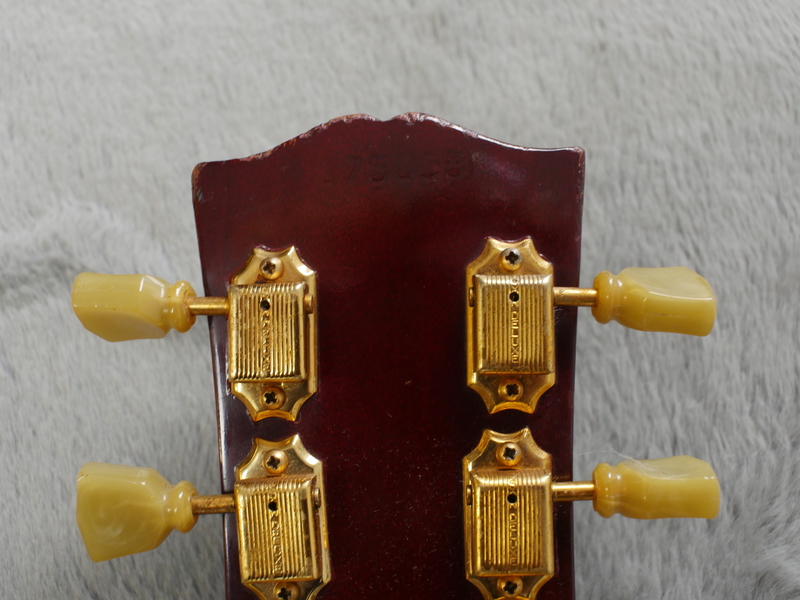 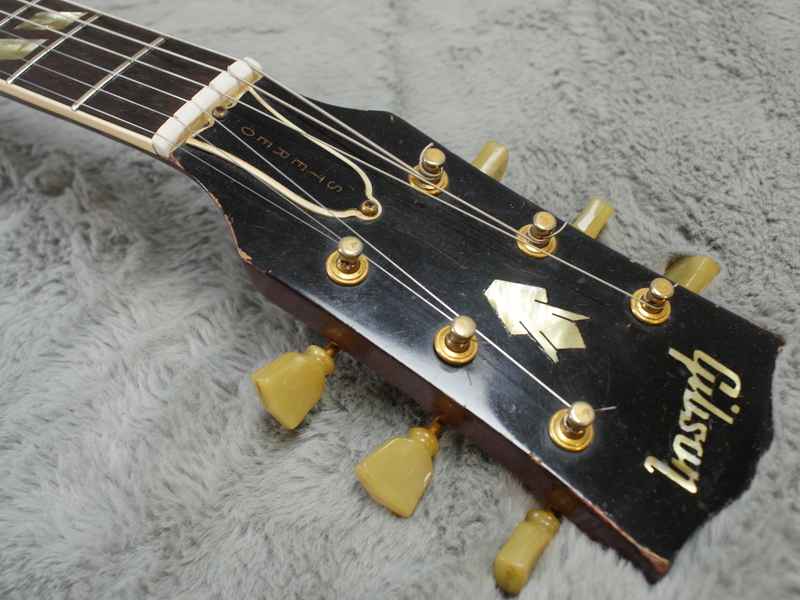 All hardware is correct and in great shape, matching the rest of the guitar perfectly and the case is a very nice, wide pebble grain black Lifton type with yellow lining.